Hundreds of thousands of children are at risk of health problems because they never play outside, the Scout Association has warned. 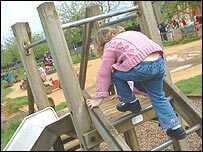 A survey of 2,000 adults and children found many young people did not know where to go to play outside, and were not motivated by outside activities. The pressures of school work and safety fears were also preventative factors. The Scout Association said between six and eight million children do not get recommended levels of exercise. The study suggested about 600,000 seven to 18-year-olds do not do any outdoor physical activities at all. Simon Carter, of the Scout Association, told the BBC: "We believe the bottom line is that the issues are knowledge of where to do activities, the belief that they're expensive and also a motivational attitude initially. "And that's about parental support and it's about peer support." The report, based on a survey of 1,000 parents and 1,000 seven to 18-year-olds, said: "Perhaps the biggest threat to getting kids out is the universal popularity of more sedate activities - all kids watch television for longer than 30 minutes on a daily or weekly basis." But it also emphasised that pressures to complete homework set by their schools kept many young people indoors. The report said: "Forty-two percent say they are not able to spend more time outdoors because they have to spend too much time on revision and coursework. "Among 16 to 18-year-olds this proportion increases to two-thirds (64%), by which age commitments such as part-time jobs and helping around the house also restrict the amount of time that can be spent outdoors. "It may be tempting to dismiss school work as an excuse not to exercise, however a significant proportion of parents back kids up on the issue." To tackle the sedentary culture, the Scout Association has launched a campaign to raise £10m for facilities and to encourage families to do outdoor activities. The association has also launched a website - kidsoutdoors.com - that offers advice on easy ways to get active. The site offers a space where young people can share images and videos of the games and sports they have been involved in. Children's Minister Kevin Brennan said: "Research shows that taking part in activities such as sports and drama not only increases pupils' confidence but also improves their educational achievement. "It's important that children and young people get a balance of formal learning and study and fun extra-curricular activities. "That is why we are putting £1.3bn into our extended school programme that provides after-school activities. Chief Scout Peter Duncan said: "The findings of this report should come with a national health warning. "It is a fact that young people who spend more time outdoors are healthier than those who do not and at the moment the outlook is bleak."